It is Friday and really unseasonably wonderful out and the MN Twins are looking very good. So I'm going to keep this very positive. Plus, it's been an easy week to think glass half-full. For example, there is this thing called the Pulitzer Prize and it's, like, a fairly big deal. So imagine my shock and laughter and fist-pumping when I heard that Paul Harding and his quietly wonderful, little, novel "Tinkers" had won the big prize. The book is distributed by our local book friends at Consortium and we just couldn't be happier for everyone involved. Like all great surprises, there is a backstory here that deserves a little telling. Go here for a nice story from the Boston Globe. Thanks go to John Mesjak for that link. Second, we had the rare problem last weekend of having too many people at an event and not enough books. Gayla Marty, author of "The Memory of Trees", read at her church in Dinkytown last Sunday. This article helped the crowd far exceed anyone's expectations and we sold out of books before the event even began. That is something that has never happened in our nearly 7 year existence. Good problem. I'll finish with a couple baseball books. Baseball books are like Abraham Lincoln books. They never stop being published and for people who aren't zealots it can be difficult to tell any of them apart. Jason Turbow has written "The Baseball Codes" with Michael Duca. This is a real insider's guide to the written and unwritten rules of the baseball world. It contains stories of brawls and brains and the kind of stories that our national pasttime is so good at creating. The next one is a book I'm in the middle of right now and am just crazy about. Mark Kurlansky is the guy who pretty much created the micro-history craze with his book "Salt." 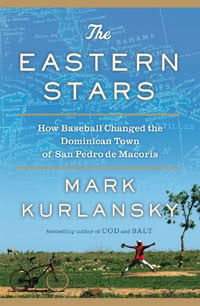 His newest is "The Eastern Stars" and focuses on the small Dominican town of San Pedro de Macorís. This town has two industries: picking sugar cane and creating outstanding baseball players. But why? And this is where Kurlansky excels. 79 men from this town have played Major League Baseball and this is a huge success. But those who don't make it really don't make it. This isn't cultural history, so much, as digging around an issue and looking at so many little facets in smart and new ways.